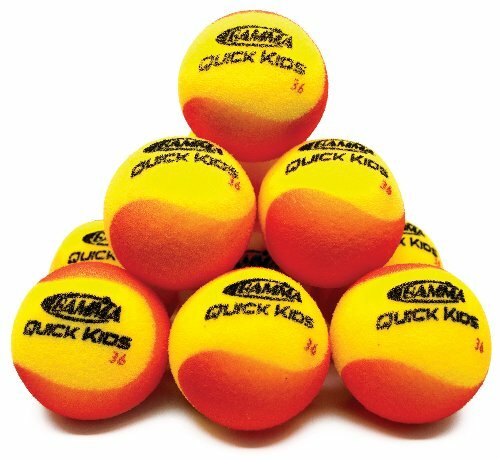 Gamma Quick Kids 36 Foam Balls are specifically for kids learning to play tennis. This foam ball is smaller, softer, and has a lower bounce than the Gamma Revolution ball, making it easier for young kids to hit consistently. Quick Kids 36 Foam Balls were designed to conform to USTA QuickStart Tennis format (36/60) standards for RED foam balls on a 36' court. ITF Stage 3 specification. Specifically for kids learning to play tennis. This foam ball is smaller, softer, and has a lower bounce than the Gamma Revolution ball, making it easier for young kids to hit consistently. Designed to conform to USTA QuickStart Tennis format (36/60) standards for RED foam balls on a 36' court.